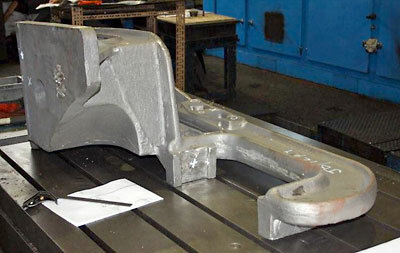 The right hand side motion bracket has been cast at The Boro' Foundry Ltd and will be machined there in the near future. It is hoped that the left hand one will be cast soon. 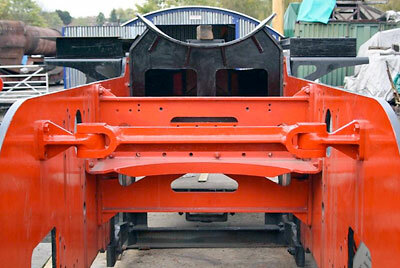 At Bridgnorth work continues on the manufacture of the front end footplating. Machining has advanced well on the fork ends of the cross stays although final boring of the holes for the pins cannot be done until the chassis of the loco is riveted up and all the horn guides and the horn blocks are riveted on to the frame plates. Work also continues on the backing plates for the horn guide liners in preparation for welding the manganese plates to them. We are very pleased to welcome David Struckett to our team. David has a similar machining background to Richard Fraser and we are delighted that he has chosen to bestow his expertise upon the 82045 project. We have a distinguished new member in Alan Clothier, a Swindon draughtsman in the early 1950s who worked on the design of the BR Standard class 3s. Alan only recently learnt of our activities in building a new one and has already visited our site at Bridgnorth. Alan will no doubt be a very useful mine of information and anecdotes on the 82xxxs. The Trust has been invited to attend this year's Warley Model Railway Exhibition at the NEC Birmingham which will be held on 19th & 20th November. This is the event of the year in the model railway calendar and we are looking forward to meeting old friends and making many new ones. We will be located in Hall 5 at stand number B64 so do come and have a chat and browse our stock of exclusive 82045 merchandise, Christmas cards and suitable gifts for Christmas. 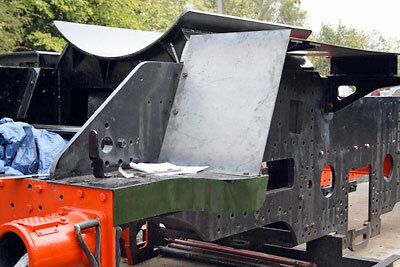 SVR members will be aware that we are the subject of this autumn's SVRA Raffle in aid of cylinders for 82045. The latest issue of SVR News contained details and a book of tickets. The organiser reports early indications of an excellent response, so here's hoping that revenues will give us a welcome influx of funding for the cylinders. We are at present awaiting competitive quotes for the job of having these cast, and anticipate that the cylinder assemblies should be in situ by late 2012, all being well. A number of books of tickets are still available, and can be obtained by sending a stamped addressed envelope with your ticket request to Barbara. Please do not send monies as a Freepost envelope will be supplied with your tickets. Tickets are £1 each and come in books of 10. The draw will be held at The Railwayman`s Arms, Bridgnorth station on 11th December 2011 and the prizes are 1st £1,000, 2nd £500, 3rd £250 and 8 consolation prizes of £25. Someone will be having a very Merry Christmas! Please support us as energetically as you can - this is an excellent way of raising our profile with the wider SVR membership and, hopefully, of recruiting many more Valley members to the Trust. 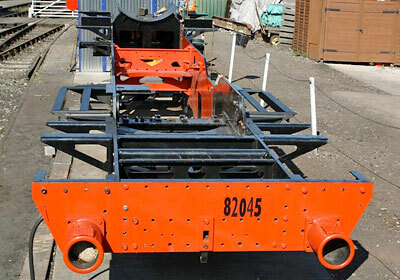 Members who have contributed specifically to the Wheel Appeal should be assured that their donations continue to be strictly ring-fenced for this purpose: we are keen to maintain the momentum on his front, too, so that we can embark on wheeling the chassis as soon as the cylinders are complete. A view from the bunker end showing the water tank support brackets bolted in place. A cross stay sitting on its brackets towards the top of the frames. All the other cross stays go between the horn guides and horn blocks. Another section of partly completed footplating temporarily in position. 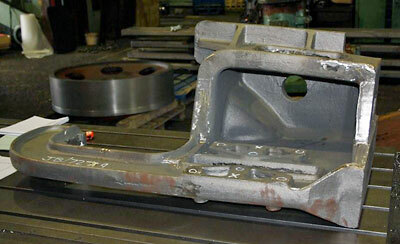 Two views of the freshly cast right hand side motion bracket.